This is a joint webinar was organised with the Assessment in Higher Education conference secretariat. This 1 hour session featured selected speakers from the Assessment in Higher Education conference (28-29 June 2017). 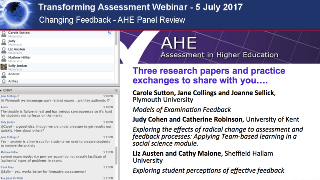 This webinar session took the form of a panel style review of some of the key messages from selected papers presented at the AHE2017 conference. Each panel member contributed to the discussion with a short overview of their presentation from the conference followed by questions and discussion between the panel and the webinar participants. * Spoke during this sesion. A set of abstracts of each speaker’s presentation.